Taken a few weeks ago when the sky was blue and the sun was out, quite unlike today. Second of the shots taken on Saturday. The show runs until 20th of March, but no need to worry that you might forget as i will keep plugging it on here. A couple of shots (one today and one tomorrow) of the pictures on the wall of the Coffee Clique, taken on the opening day of the exhibition. A big thank you to Julie, the Red Shoes and especially to Carolyn for making the day so great. One of the best things was meeting people who read the blog, it was great to see you all, hope i can keep up the good work, all your comment were really encouraging. There is a famous scene in the film The Commitments, the hero of the film is lying in the bath day dreaming about being interview regarding the success of his band. How many people out there have do something similar, I known I have, so last Thursday the dream became a reality when I was interviewed by our local radio station. I had sent out a press realise about the Leek Daily photo exhibition and was expecting nothing more than a quick mention on their “what on” feature, so imagine my surprise (and horror) when they contacted me and asked if I would pop in for an interview on their morning show! I have to admit I was very nervous, I had never been in a radio station before, let alone on air, so sitting in the waiting room listening to the show was like a form of torture. Once in the studio I was immediately put at ease by Mervyn Gamage and Simon Edwards the 2 DJ’s and after a quick chat while a couple of records played, I was on air!!! Taken well after sunset on a very cold December night. 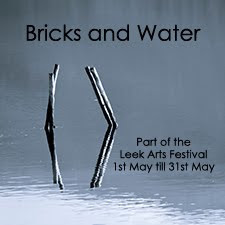 The Exhibition has started, by now all the work should be done and its up to the people of Leek to tell me what they think! But not just them, i've put a link to the slide show showing all the shots on display, hope you like them. The last of my shots from Three shires head taken in the snow. Detail shot of a snow covered canal boat on the Leek canal. The lane down the side of Bestwicks scrap yard. Taken the same day as the last canal sun set, this shot marks the start of a second year on the blog! This is one of my oldest shots, taken a number of years ago at Rudyard lake, i went to photograph the sun rising over the lake and came away with this shot. Trying to find some shots that don't have snow on them, all the white stuff is getting boring, this was taken at the hight of the summer at Three Shires head. The school i used to go to, this shot is the same as one shown last year in black and white, but this time i have turned it into a high dynamic range shot. No the title is not a spelling error, this was our local golf course last year after a spell of heavy rain. This was taken on a run up in to the hills around Leek just after are last big snow fall. One of my favourite shots, taken a few years ago on slide film, Rudyard lake on a vary still morning. A very cold winter sunset on the canal just outside of Leek. A Skip wagon bearing the name of one of Leek more famous families, but also on there is the name of the drive, just by the drivers window, he happens to be an old school friend and now drives this cool looking truck. This was taken a few weeks ago during the snow, the drifts are around 5 feet high, the road is the one that runs around the foot of the Roaches. A tarpaulin covering a boat on the canal. 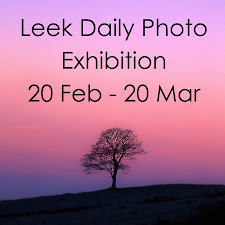 Leek daily photo 1st annual photo exhibition. I've finally got my act together and organised my first solo photographic exhibition, it is due to start on the 20th February and will run for a month. 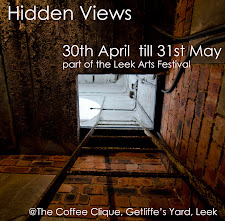 The venue is The Coffee Clique, Getliffe's Yard in Leek, the exhibition is free of charge, but I'm sure you can be tempted to buy a coffee and cake as you look at the photos. All the images are from this blog, there is likely to be around 30 framed photos in all (the short list at the moment stands at 70 so a bit of editing still needs to be done) and all will be for sale. As this blog has a world wide following i will also put the images on a slide show to start on line on the same day, just so you don't feel left out. The reason for the show is that on the 14th February this blog is a year old and i wanted to celebrate the occasion in a fitting way. Photo for today is of a tree on the Roaches at dawn.